I wonder how far in the future we’ll have to go before all the comics about driving are weird because we all have self-driving cars. I liked watching the old Warner Brothers cartoons from the 40’s when I was a kid but there were lots of jokes I only understood through context. Like fountain pens, cars that you had to crank a handle to start and telephones that you had to ask the operator to physically plug you into the phone you wanted to call. 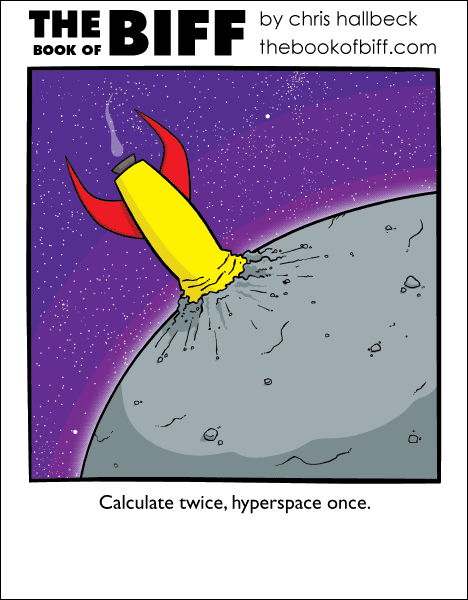 At least we are still a ways off from personal rocket ships being common. Today’s Maximumble is a constant interruption. Yeah… was watch a 1970’s sitcom yesterday. None of the desks in the office had computers. What did these people do? You’ve changed your Biff picture! It looks more like how you draw Biff at this moment! A favorite story about once-fantastic tech becomming commonplace is “It’s Such a Nice Day” by Asimov. Or even his “The Fun They Had”. Yes, perhaps you didn’t realize how old they are?